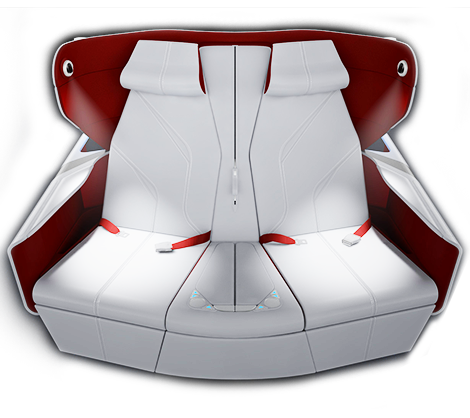 The highly customizable seat surroundings are ideal for custom-made orders. The modular centre console offers yet more customisation potential allowing the customer to fine-tune seat functionality and stowage. While the ottoman provides ample stowage for carry-on items. Optimares will be happy to provide a unique look and finish to the seat. to leave their suite without disturbing their neighbouring passenger. Also crew could use the egress for serving. The gently cantered angle of the seats provides a naturally private position, offering the option to socialise if desired. In a high density configuration, maxima delivers a 77� bed at a 58� pitch. When the pitch is increased to 71�, maxima plus delivers aisle access for all passengers while still delivering a very competitive PAX density. The seats are installed at an angle of less than 12 degrees. This allows a traditional certification process.